There are some artists and writers that truly utilize the medium of comic books and graphic novels to create a unique narrative experience that only sequential art can deliver. Craig Thompson is one of those individuals. 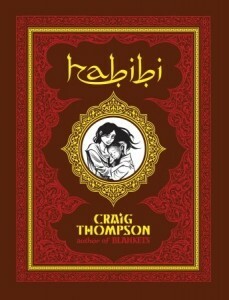 Following the success of his semi-autobiographical Blankets, Thompson has once again given readers a poignant and sincere tale of love and spirituality in Habibi (Pantheon; 672 pages). Set in a world that is both historical and modern, mixing epic deserts and extravagant palaces with modern city landscapes and industrial wastelands, readers follow Dodola and Zam, two children who escape from slavery by fleeing to the desert. They struggle against a world of greed, lust, and refuse, which forces their paths apart. It is their evolving spirituality, their love for each other and for storytelling that moves them to find each other again. Habibi contains a cast of characters that are sympathetic and cartoonish. Dodola, Zam and a number of supporting characters are achingly human, while the simpler characters in the story are there to either propel the plot forward or to reinforce the narrative’s symbolic qualities. Thompson’s writing makes great use of Islam, sharing many of its teachings, tales, and lessons concurrently with Dodola and Zam’s story, providing a lens to view their circumstances and to inform past and future events in the story. Thompson also uses Islam as a guide for navigating Habibi’s many themes, such as romantic and familial relationships, our ties to nature, and the consequences of wastefulness. And as if trying to combat post-9/11 antagonism toward Islam, Habibi showcases the faith’s beauty. For a graphic novel, the art is just as important, of course, as the writing. Throughout, Thompson’s ink work is nothing short of awe-inspiring, especially in the book’s many breathtaking double-page spreads. The amount of detail is unbelievable; one can see why it took Thompson eight years to follow-up Blankets. And the compositions within each panel are moving and full of life, as if each panel can tell a story of its own. He also does an admirable job of controlling the pacing of the reader’s eye — and, as a result, the pace of the story — through placement of the words and the layout of the panels. Page layouts easily draw the eye to where Thompson wants it to go, and in many cases creates beautiful eye lines across pages, creating an almost musical rhythm to his storytelling. 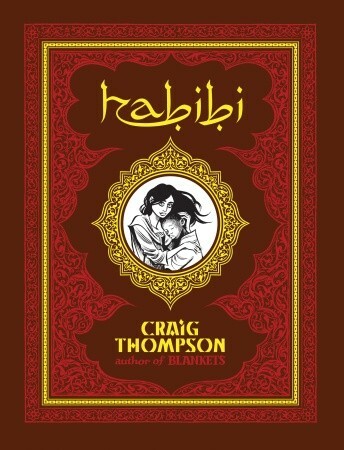 Habibi is a prime example of what could never be done with words or art alone, and why sequential art exists. It is an ambitious landmark work in the history of the graphic novel. In his first book of fiction, Pulp and Paper (University Of Iowa Press; 192 pages), Josh Rolnick offers a collection of eight stories dealing with those various moments of transition in our lives from which there is no return — moments that require his protagonists to confront their losses, weaknesses and failures. “Funnyboy” follows the attempts of a father to avoid confrontation and possible resolution with the teenage girl who accidentally killed his son in a car accident. Through him the reader experiences what it is like for those who refuse to move on, who refuse to cross over and begin a new stage of life. The death of a loved one comes up again in “Innkeeping,” when a teenage boy, Will, must cope with the possibility of his mother beginning a relationship with a new man after the death of his father, a death that has haunted his and his mother’s lives. Unlike “Funnyboy,” we see through Will what it is to navigate such hardships to reach, hopefully, a restored state of living. Rolnick also examines old age. In “The Carousel,” elderly Mr. Polonsky operates a decrepit and lonely carousel on Coney Island, which is seeing so few customers he has already resolved to close it down for good. “The Carousel” examines the passing of time as we grow to live it, and how the world around us moves on. 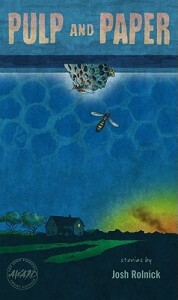 Meanwhile, the title story, “Pulp and Paper, ”observes the life-changing consequences compassion can have. Though the book may deal with some emotionally heavy matter, it mostly refuses to showcase the harsher realities associated with death and aging. Some may choose to see the stories as sentimental because of this. But Rolnick’s writing is genuinely compassionate, and there’s nothing phony about his characters. If anything, his story collection is a reassuring reminder of how we can survive the inherent suffering of life.